1,100 Pounds of Matzo in Kathmandu It was three hours to sundown before the first night of Passover and the kitchen in this Kathmandu hotel was a steamy mess. Bath tub-sized pots bubbled with matzo ball soup, 900 chicken hunks in lava-like tomato sauce, and the googly eyes of a thousand boiled eggs. The night before, a team of them had chopped onions and peeled vegetables until one in the morning to help prepare the world's largest Passover Seder, which takes place in Nepal's capital. 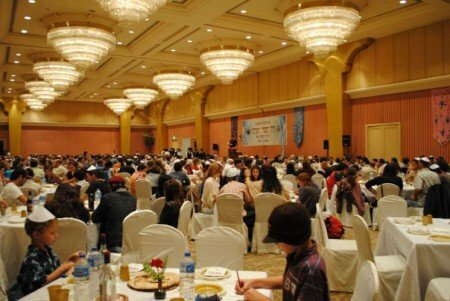 More than a thousand guests, mostly Jewish backpackers who flock to Nepal after their military service, were expected for the holiday dinner that commemorates the Jewish exodus from ancient Egypt. Alon David, 24 with dark hair pulled into a ponytail, was volunteering for his second Passover Seder in Nepal. "If you're not in Israel, you should still make the atmosphere," he said, squinting through oniony tears. Aviv Hayun, the chef, had another problem. The oven hadn't been made kosher. How, then, to keep the food warm? "Where to put a thousand people's food?" he lamented. Moments later, the kitchen plunged into darkness. Kathmandu, plagued by 12-hour power cuts, had shut out the electricity unexpectedly. When the hotel's generator kicked in, the cooks resumed their race against sundown. Hayun works in catering in Israel, so the dinner wasn't his largest event. "But it is the biggest mess I've seen," he sighed, pushing back his hair. The 1,100 people who attended the Seder in the hotel's cavernous, chandelier-lit ballroom enjoyed endless plates of food - seven kinds of salad, curried potatoes, stewed vegetables, fish, soup, chicken -- that emerged from the kitchen. It was a massive guest list for a dinner that is usually celebrated intimately at home. (In addition to young backpackers, some older Israelis and families attended too). In the days of Nepal's 10-year civil war from 1996 to 2006, trucks of matzo en route to Kathmandu were routinely stopped by rebel and government roadblocks. One time, rickety Nepali trucks broke down and kosher supplies had to be helicoptered to Kathmandu in time for the holiday. Rabbi Chezki Lifshitz, a 38-year-old with a bearded yet cherubic face, heads the Kathmandu branch of Chabad, the Jewish organization that organizes the Seder. In 1988, Chabad in Kathmandu organized the first community Seder outside of Israel. Three hundred people attended. That number swelled to a high of 1,800 in 2002. Globe-trotting Israelis and Jews "are trying to keep their traditions with them even if they go far away," explained Lifshitz. Israelis come to Nepal to hike, river raft, bungee jump, hang out in cafés, and generally let down their hair, often literally. During military service "we have a crazy reality," said Yosi Saranga. The 22-year-old Israeli was strumming a guitar and crooning Radiohead on the patio of Chabad House, the Jewish community center here. But in Nepal, "sab kuch milega" he said brightly, translating the common Hindi phrase as "Anything is possible," which could have been the motto in the lead-up to the Seder. The preparations began the afternoon before at the Chabad House, when its modest kitchen was made kosher by splashing hot water on countertops and stoves, and papering surfaces with tin foil. Inside Chabad House, lavender walls, red paper lampshades, and napping Israelis sprawled on sagging couches, giving the place a college clubhouse vibe. Buckets scattered across the floor caught leaks dripping from the flimsy, corrugated roof. At midnight, the newly kosher cauldrons were piled into tiny Nepali taxis and taken to the hotel kitchen for the next day's cooking. The pots clanged like bells as the taxi lurched into the rain-filled potholes cratering Kathmandu's streets. Early the next morning, food and supplies were ferried to the hotel in those tiny taxis -- at least 35 trips back and forth. By evening, the grandeur of the hotel's ballroom belied the chaos in the kitchen earlier that day. Bottles of wine sat on tables covered with white cloths. In the sea of Israelis, dreadlocks and hands covered with henna designs were not uncommon. Those who didn't have kippas to cover their heads wore traditional Nepali topi hats instead (a bin of spare topis stood by the door). After a few cups of requisite wine, many Israelis stood on their chairs, singing and cheering. A young Jewish man from New Jersey surveyed the rowdy crowd of young Israelis, who enjoy their reputation of knowing how to party. "This is so Israeli," he said with amazement. Shamir Waldman, a 33-year-old Brazilian Jew working in Hong Kong, was surprised at the Seder's customization for non-Israelis. "I've never seen anything like that." He smiled, as if remembering he was in Nepal. "You have to be flexible so everyone feels at home."